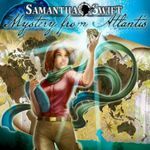 More twists than ever before as archaeologist-adventurer Samantha Swift races across the globe in a daring search for the missing pieces to an Atlantean treasure. Dire consequences for humanity are at stake from a calculating new villain who crosses her path at every turn. In the Mystery from Atlantis, players can delve into more than 40 hidden-object adventure levels with clever puzzles to solve all along the way. For the first time, players can customize their adventure. Choose a relaxed experience with a robust hint system, or a timed challenge with scoring. Repeat the fun in either mode and unlock the special hidden object mode for those times when you just want to seek and find.